Restivo, A., "The silence of The Birds: sound aesthetics and public space in later Hitchcock", in Past and Future Hitchcock, ed. R. Allen & S. Ishii-Gonzáles (London/New York: Routledge, 2004), 164–78. Grimonprez is here referring to the Treehouse of Horror VII episode (season 8, episode 1, first aired on 27 October 1996). This is reminiscent of Edgar Allen Poe's William Wilson (1839), a story of mis- taken identity where the protagonist is dogged by his counterpart. Elsaesser, T., "The Dandy in Hitchcock", in Alfred Hitchcock: Centenary Essays, ed. 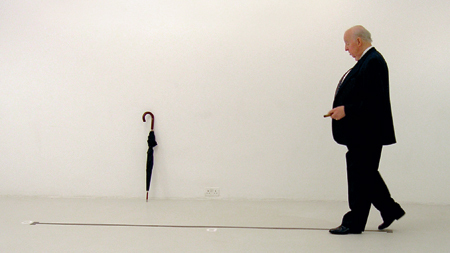 R. Allen & S. Ishii-Gonzales (London: BFI, 1999), 3–14. A Streetcar named Marge (season 4, episode 2, first aired 1 October 1992) and Bart of Darkness (season 6, episode 1, first aired 4 September 1994). Elsaesser, T., "'Casting Around': Hitchcock's Absence", in Johan Grimonprez: Looking for Alfred, ed. S. Bode (Ostfildern-Ruit: Hatje Cantz, 2007). Restivo, A., "The silence of The Birds: sound aesthetics and public space in later Hitchcock", in Past and Future Hitchcock, ed. R. Allen & S. Ishii-Gonzáles (London/New York: Routledge, 2004), 173. Hitchcock is Not Himself Today. Chris Darke: We're talking only a short distance away from The Gainsborough, the first film studio Hitchcock ever worked in. Having been on the trail of Hitchcock for almost four years with this project, you must have the feeling that his shadow is everywhere you go. Johan Grimonprez: This reminds me of the MacGuffin anecdote: I've read three, four, maybe five versions of this story where Hitchcock tells an almost but not quite identical account about two guys who meet on a train. One asks the other: "What's that thing you're carrying in the luggage rack?" "That's a MacGuffin" comes the answer. The first guy follows, "What's a MacGuffin?" The second replies that "It's a device to trap lions in the Scottish Highlands", at which point the first retorts: "But there are no lions in the Scottish Highlands." Nonchalantly, the reply comes as "Well, then that's no MacGuffin!" In our search for the perfect Hitchcock, perhaps he has himself become our own MacGuffin, our illusion pushing the search forward. In the end it's like those Russian dolls, one hiding within another and within another and within another, until finally you realize that there is nothing hiding beneath at all. J.G. : In a way, yes. I asked myself: "How can I solve this?" The spontaneous solution was to go for the complete opposite, our Chinese Hitchcock lookalike, Bruce Ho. It turned out to be a happy accident. We subsequently integrated some footage of Ron into the film, but since so much was missing, I felt I needed to visit him again and I came to London to interview him. This subsequent footage forms a major part of a further development of Looking for Alfred (2005), a project called Double Take (2009). In a way, I'm aware that I'm continuing to look for something I haven't quite found, and maybe never can. C.D. : One of the things you find in your search is that Hitchcock is cinema, or cinema at a certain moment in its history, when first confronted by television. The challenge of television was one that Hitchcock took on in a variety of ways: fronting, in a markedly sardonic fashion, his own TV series, Alfred Hitchcock Presents (1955–62), as well as adopting TV production methods (short schedule, small crew, black and white) to make Psycho (1960), for example. J.G. : Indeed, but I'd add that Hitchcock had already made a number of similar transitions: the change from silent to sound cinema, from black and white to colour, and also the change from Britain to Hollywood. At the height of his career, in the mid-fifties, he was becoming acutely aware of the challenge of television. That's why The Birds (1963) is pivotal: it reflects the ideology of that particular period, with television—just like the birds themselves—about to invade the home. It represents a moment when Hollywood had to redefine itself, losing its audience to television. C.D. : Given the role that doubles and doubling play in Psycho and Vertigo (1958), why choose The Birds as your central Hitchcock work? J.G. : The Birds has generated every possible contradictory interpretation by Hitchcock scholars: the birds embody the tensions between the characters, they're a metaphor for Melanie's sexuality or the repressed anxiety of the mother, etc. But, like the MacGuffin, they refuse interpretation. I went for The Birds to allude to Hitchcock's ambivalent relationship with television and, by way of a detour, to lead back to the theme of the double—in particular, television as cinema's "double". I came across an essay by Angelo Restivo in which he asks the interesting question: "Why does nobody switch on the TV set in The Birds? "1 For me, the first thing you'd do if trapped in a house with some kind of catastrophe going on outside would be to turn on the TV! The implication is that the model community of Bodega Bay is being invaded by birds in the same way that television invades suburbia, turning the American nuclear family into happy consumers; in the process (and this was the concern for filmmakers like Hitchcock) displacing people's relationship with cinema. In Hitchcock's words: "TV brought murder into the American household, where it always belonged." It is interesting that when Hitchcock chooses to cross over to television in the form of Alfred Hitchcock Presents, he goes out of his way to poke fun at TV. He points out the extent to which the medium is itself infected by advertising, hijacked by the commercial break. Although he made his name in cinema, Alfred Hitchcock Presents, and its successor, The Alfred Hitchcock Hour (1962–65), were equally responsible for turning Hitchcock into a household figure: the belly, the protruding lip, the double chin... Over a period of around ten years, Hitchcock hosted about 370 episodes of his TV series. He introduced each and every one, as he said "to lay his customary one-minute egg", in which he basically berated the sponsors while announcing the commercials with a large dose of sardonic humour. This adds up to about 360 minutes of Hitchcock performances which have hardly been examined at all in Film Studies, although they constitute an essential part of what Hitchcock was about: the biggest television prankster. C.D. : It strikes me that Hitchcock colonized our childhood imagination: yours, mine, and that of the New Wave directors in 1950s Paris, to mention only a few of his many victims! How old were you when you saw your first Hitchcock? Was it in a cinema or on TV? When did you realize he was more than just another filmmaker? J.G. : As a little kid, I remember a paperback from my Dad's bookshelves. On the cover was a man who looked very much like my Dad: double chin, bald head, a protruding lip puffing on a cigar, a big belly with the pants set too high. I guess that must have been my first confrontation with the image of Hitchcock, only to later learn there's more than just my Dad to Hitchcock's image. Funnily enough, as we were casting in Belgium, I invited my Dad along, never thinking he would make it into the film. However, he ended up restaging Hitchcock's cameo from Strangers on a Train (1951), carrying a double bass, while picking up the bowler hat that rolls into shot. As for Hitchcock's films, I didn't discover them in the cinema. We're a generation who discovered his legacy second hand, either through re-runs on television or through video and DVD (the "doubling" of his films, as it were). The very first time I saw a cinema screening of Vertigo, reels two and three were projected in the wrong order which meant I saw the point where Madeleine had changed into Judy before I should have, giving the plot a very disconcerting and bizarre angle. But this is actually very similar to how with DVD you can skip scenes, and jump back and forth through the storyline. C.D. : In Looking for Alfred, you also jump backwards and forwards combining cameo appearances from Hitchcock films from completely different eras. Tell me a little more about what attracted you to these cameos. J.G. : Hitchcock loved to play hide-and-seek with himself, as well as with the audience. "Spot the director," as Thomas Leitch calls it. Or, in the words of Raymond Bellour, Hitchcock, by making a cameo, "inscribed himself in the film's chain of fantasy". To invoke a more literary model, it's a classic case of the storyteller mirroring himself in the story. The cameos started when he ran out of extras on the set of his directorial debut, The Lodger (1927), and to save money he took on the role himself. Later on, they became a kind of superstitious ritual that he enacted in each of his films. Often, he's a casual passer-by or a fellow traveller who pops up at an airport, in a train, in a street or a hotel lobby. His appearance, when it arrives, frequently foreshadows a fateful decision or a turning point in the story. In Strangers on a Train, for example, Hitchcock boards the train where the two strangers are about to exchange murders. The larger and more devoted his audience became, however, the more familiar they were with both Hitchcock's image and the regular nature of his walk-on appearances. Because of this, the cameos were in danger of turning into a gag that distracted from the story, and he decided to get them out of the way as early as possible in a film. Think of North by Northwest (1959) for example, when he misses the bus just before his name appears in the credits. We actually restaged this cameo during the LA casting, the deal being that I'd invite the doubles for dinner on the condition that they'd re-enact the cameo on the way there. We attempted to shoot the scene on Wilshire Boulevard but it turned out to be trickier than planned. Unexpectedly, the bus drivers didn't play their parts by being too friendly and hitting the brakes upon seeing our Hitchcocks running after them in their rear-view mirrors! C.D. 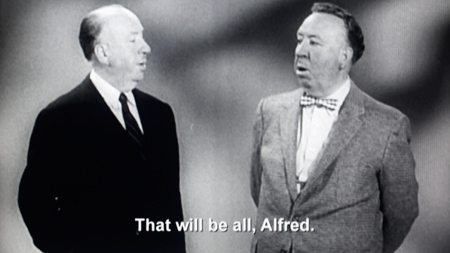 : In Looking for Alfred, you address Hitchcock's cameo appearances, while in your new, extended version of the project Double Take you look more closely at his TV persona. One of the things you seem to want to do, with the cameos at least, is to make them come alive again through one of the strange outgrowths of celebrity culture, the celebrity impersonator. Do you call on this as a way of casting a light on the Hitchcock persona or on his relationship with cinema and television? J.G. : The fact that Hitchcock always wore a suit, for example, was a disguise to hide his shyness and unease with his own body. As the "cavalier of the macabre", as he came to be known, he would transform this into a persona that became part and parcel of his practical jokes. And then later, in his appearances on TV, he clearly, and very cleverly, played with doubles of that persona. He would work the strings of a life-size lookalike marionette, walk off with his own wax head under his arm (which later ended up in his wife's fridge as a prank), dress as a woman or a dog. He'd be mistaken for himself, meet his stand-in, or often appear as his own brother explaining that Alfred is nowhere to be found... The funniest example of all is when Hitchcock himself is disqualified in the first round of a Hitchcock lookalike contest, with him playing three other lookalikes introducing his show! C.D. : But my point is that when you start to deal with the celebrity lookalike as double, don't you risk losing what's crucial to Borges, Dostoyevsky and Poe—just as it is to José Saramago's recent novel, The Double (2004)—the underpinning of existential angst that's in all those classic narratives of the double? After all, a doppelganger narrative is meant to make you feel that the ground beneath your feet is a bit uncertain, that the world is a little strange. J.G. : Absolutely. Seeing one's own doppelganger is usually depicted as a harbinger of bad luck, and it's often a premonition of death. Also, strangely, the double is believed to have no reflection in the mirror. Because he performs the protagonist's actions in advance, he is the mirror that eventually takes over. It's like the evil twins narrative with Bart and Hugo Simpson: the double plays the same part as the hero but from the evil angle.2 The template for the film I'm working on at the moment, Double Take, is based on a similar plot to that, where a Hitchcock doppelganger takes over the role of presenting the Alfred Hitchcock Presents episode, The Case of Mr. Pelham (1955).3 The narration is inspired by the Borges novella The Other (1972), in which the author encounters his older self. It's interesting to note that there are two versions of this story, as Borges wrote a later version called August 25, 1983 (1983). The story has its own double! It's this later version that novelist Tom McCarthy reworked for Double Take. In Tom's reworked version, it is Hitchcock who bumps into Hitchcock, a clear allusion to his famous cameos where Hitchcock, the storyteller, doubles himself in his own stories. C.D. : In both Looking for Alfred and Double Take you examine the function of iconography in Hitchcock. There are everyday objects and details that are deadly (lethal cups of tea and coffee), or malign (sparrows that kill! ), or that act as a form of disguise, such as the bowler hat, an affectation that Hitchcock shared with Magritte. J.G. : I could almost imagine Magritte and Hitchcock disguised as Laurel and Hardy appearing from around the corner in the Palais des Beaux-Arts in Brussels! Or, as the famous double act Thomson and Thompson, the Belgian bowler-hatted detectives from the Tintin books. Thomson and Thompson are utterly Belgian. There's something about their doubleness that rings so true for a country that's embedded in the cultural schizophrenia of two languages living side by side; one constantly translating or repeating the other and never taking it seriously. Everything has to be duplicated or translated. Just like Thomson and Thompson, you're always forced to do things twice (and our doubled governing institutions, the Flemish and the Walloon). Before you even start talking, you first have to decide which language you'll speak in. So misunderstanding becomes culture, the poetry of misinterpretation. And words and things start to disconnect. Belgian reality comes subtitled. Simply in the act of buying milk and reading the labels you're immediately enmeshed in the act of translation. To always be confronted with the other side of things sharpens the sense of irony. Most television programmes and films are subtitled (a big chunk of our television programmes were always imported). This is second nature so, as a kid, you think the whole world is subtitled. You grow up translating the world. This is so much part of Magritte's language paintings, as well. He subtitles his pipe with "pipe" and "not a pipe". It's always already something else. It's maybe this irony that leads to a particular variation of surrealism. "Today there were two Mondays," writes Magritte. "To speak is to commit tautologies," says Borges. Like all saboteurs, Hitchcock and Magritte avoided detection by dressing inconspicuously in their everyday suits, using them as bourgeois disguises, but through their work they were both out to disrupt the apparatus of bourgeois reality—like Magritte's favourite anti-hero Fantomas, a man of infinite disguises who always manages to outwit the police. For Magritte, the bowler hat is a prop to conceal one's identity beneath the guise of everyday life, just as Hitchcock had infinite disguises in his television series (usually accompanied with an oversized prop, as in Magritte's paintings). C.D. : But is it the case that one retrospectively finds in Hitchcock the image one wants to find? Such as the image of the subversive artist working in the heart of Hollywood. Do you feel sure that he was as subversive as these retrospective assessments cast him? J.G. : No, there's a complete bourgeois pose, as with Magritte. Nonetheless, in the work itself he absolutely pushes the language of cinema and now, in retrospect, those things have become part of our common everyday language. Of course, he was limited by the constraints of the time, and of working for a major studio, but still he was trying to stretch the agenda and the vocabulary. We have to be very specific about which period in his career we're talking about. I certainly feel he takes on a number of taboos in his television work. The criminal often gets away with the crime; and Hitchcock himself, of course, takes a few jabs at the programme's sponsor. And then I think of North by Northwest—a genius film, pre-James Bond, that set the genre, but in which the politics are so right wing, re-inscribing itself in the Cold War. C.D. : In Looking for Alfred and Double Take you're dealing with Hitchcock as representative of cinema at a moment when it's having to deal with the challenge from TV, a transitional moment. I'm wondering what you think about the fact that you're doing this at a moment when cinema is undergoing a further mutation relative to digitalization and when the gallery and the museum have become sites where cinema— quite often through the figure of Hitchcock—becomes if not personified then memorialized? The gallery is one part of all of this, I think, but it's bigger than that. It has to do with a larger shift brought about by digital technology where images are increasingly available in so many different ways. We already mentioned how our generation grew up more with television than cinema. DVD makes Hitchcock even more readily available, to the point where you needn't ever have to go to the cinema. The way we relate to the world through its double, through its representation, changed the way we plugged into reality. There's an echo here of the themes I explored in dial H-I-S-T-O-R-Y (1997); a sense of having been born at a certain moment in time, in 1962 (the year of the making of The Birds! ), when the shift from cinemas to television was fully happening and Hollywood had to redefine itself. C.D. : dial H-I-S-T-O-R-Y raises an interesting question regarding the way you work. The length of time over which you tend to develop a project seems to allow you to go deeper into an idea or obsession and uncover connections that other more superficial appraisals of the subject frequently miss. dial H-I-S-T-O-R-Y, and the way you're dealing with Hitchcock, could be described as a kind of "media archaeology". You're interested in the way that media mutate and the ways that mass perception changes. J.G. : It's also a way of questioning myself as an artist. It's present in dial H-I-S-T-O-R-Y, in the use of Don DeLillo's Mao II (1991) where the writer is in dialogue with a terrorist and in which the book contends that the terrorist has taken over the role of the writer in terms of the range of his influence over what DeLillo calls "the inner life of the culture". Where does he stand? It's a way to break open those boundaries and ask where, as an artist, do you stand politically and relative to the mainstream. It's a way of opening up the agenda rather than trying to reduce it. I do take a lot of time over each of my works! I like to chew the cud like a cow! But working in this way helps me see parallels and continuities in them. There is a metaphor of birds-as-planes that carries over from dial H-I-S-T-O-R-Y to the present work on Hitchcock, but which goes all the way back to a much earlier piece, Kobarweng or Where is Your Helicopter? (1992). Tracing the after-shocks of the first encounter between a group of New Guinean villagers and western scientists who first arrived, by aircraft, into this "uncharted territory", Kobarweng translates literally as "language" of "the airplane". Having very much an auditive perception of their surroundings, these New Guineans inscribed the unfamiliar noises of propellors within their cosmology, interpreting them as animal, and particularly bird, sounds. With this in mind, it is interesting to note that at their core, all my works deal with threats emanating from the sky! This intercontextual reading also allows me to pull in a number of other reference points, such as Slavoj Žižek's description of the 9/11 attacks as a real-life version of The Birds. For Žižek, 9/11 is the ultimate Hitchcockian threat that suddenly appears out of nowhere. He's thinking specifically of the scene when Melanie (Tippi Hedren) approaches the Bodega Bay pier in a small boat, and a single seagull, first perceived as an indistinguishable dark blot, unexpectedly swoops down and gashes her forehead; an image that is strikingly similar to the plane hitting the second World Trade Center tower. Our world is packed with an abundance of images that constantly bombard us, and inevitably much of our reality today is filtered through cinema and media imagery. In that respect, 9/11 brought fiction back to haunt us as reality—that eerie sense that we've seen these things before; that things are doubled. There's an echo here of what Thomas Elsaesser refers to as an "ontological shift", in which Hollywood seems to run ahead of the facts.7 It's a direction I'm looking to explore further in Double Take. C.D. : We should make it clear that Double Take is a project that doesn't yet exist as a finished work and is very different to the gallery film of Looking for Alfred. J.G. : It's a "double take" on the whole project. You look at it twice. There are elements from the Looking for Alfred film, and lots more from the casting material. There is the doppelganger plot that I mentioned above in relation to Hitchcock's use of a double persona on Alfred Hitchcock Presents. And, in relation to that, there's a much greater spotlight on Ron Burrage. I believe that Hitchcock would have loved to encounter himself. And in that sense, Ron was a big part of pushing this project into something else. Here's someone from a totally different world, whose connection with a Hollywood icon, through circumstances not entirely of his making, has become his life. It seemed an interesting twist of fate to start exploring. For years, Ron impersonated Hitchcock in everything ranging from Robert Lepage's Le Confessional (1995) (itself a remake), to soap and shampoo commercials, to guest appearances in music videos for Oasis, to introducing Hitchcock Presents on Italian television, to starring in a Japanese documentary about the life of the master. There was more to the resemblance than met the eye. As well as Hitchcock's mannerisms, Ron seems to have adopted much of Hitchcock's persona, including his fondness for pranks. In one of those great coincidences, Ron actually shares his birthday (13 August) with Hitchcock. The first time he told me this, he actually said "Our birthday", and when pressed on this, he joked: "The Queen would say 'We are not amused'." "We." "That is, Alfred and me." The Hitchcock centenary (1999) was a busy time for Ron. Among the many tribute events that year, Ron attended the launch of the newly restored print of The Birds in Locarno, at which Tippi Hedren, after all her history with Hitchcock, was introduced to the audience by doppelganger Ron. In a further (Hitchcockian) twist, the event actually took place on 13 August, with Ron not only filling in for the master, but literally taking over his role, and cutting (his 70th and Hitchcock's 100th) birthday cake on stage. 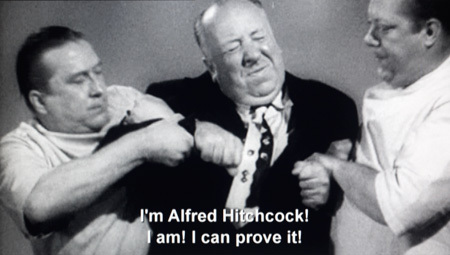 This phenomenon of a doubling of the personality—a recurring theme in Hitchcock's films—appears to have affected his lookalike. He is the "Wrong Man", displaced by his uncanny likeness to someone else. To an extent, he has interiorized this identity and blurred the lines between his reality and Hollywood celebrity. C.D. : I understand he doesn't particularly like H's films. J.G. : He likes opera! He and his partner, an occasional Rembrandt lookalike who unfortunately passed away last year, used to go to the opera whenever they could. Ron was a flight attendant for British Airways, and one day, by strange twist of fate, found himself serving tea to Ingrid Bergman. Before that he worked in London at Claridge's and the Savoy; places that Hitchcock frequented whenever he was back over from Hollywood. But here Ron was at the opposite end of the food chain: a waiter serving Cary Grant, James Mason and, among others, Laurel and Hardy. Next time, I promised to turn things around and take him for lunch at Claridge's for our next rendezvous. But for the moment we've only had coffee! The version of Double Take I'm working on starts with a Folgers coffee commercial and then jumps to the cup of coffee we share with Ron at his home. And hovering in the background, of course, is Hitchcock's famous poisoned coffee cup, his way of spiking the ritual products of the commercial break. J.G. : The screenwriter of The Birds, Evan Hunter, wanted to do something with the relationship between Melanie and the mother that would libidinize the plot. So there's a certain tension beneath that suburban setting, a love story underneath the tea ritual. And remember, too, how the birds zoom in on the teacups... Hitchcock treats the cup of coffee with deserved suspicion. His strong female leads are often portrayed with their sexuality as perilous, set against a figure of male hysteria, a man who is often doubled, or trapped in a case of mistaken identity. And his fear of intimacy (or death) is projected back onto the female character as a way to try to contain her, and poison her (Notorious (1946) and Suspicion (1941)). However, in Looking for Alfred the tables are turned. Instead of the female protagonist being trapped and poisoned, she brings the poisoned cup to Hitchcock. Not only does she poison him but, instead of being attacked by the birds, she devours the bird. Restivo relates how coffee houses were an integral part of early democratic culture, and how these places of conversation and discussion were increasingly replaced by television giving us the commercial break (instead of the coffee break). It's interesting how the characters in The Birds fail to forge social links, and by extension a public sphere is lost to consumer culture (and its repressed undercurrent: the catastrophe). But here, of course, the birds—as harbingers of catastrophe—shatter the coffee cups, invade the world of domestic bliss! It's maybe not a coincidence that 1963, the year of The Birds, was also the year when the Federal Communications Commission limited the amount of advertising on radio and television! I haven't yet fully developed how I'm going to integrate all this into Double Take, but it definitely ties back into the idea of the commercial break and the happy ending. Although the growing popularity of television in the 1960s didn't mean the end of cinema, it did mark the end of "The End". By which I mean that the words themselves went out of fashion, losing out to endless credits. The Birds is the first Hitchcock film not to feature "The End". He leaves it deliberately open-ended (as if waiting for the next episode or instalment), and then dispenses with "The End" in all of his subsequent films. To an extent, you could say that television has redefined what an "end" is all about. It gave us everlasting TV serials with postponed endings, coached us in the obsessive behaviour of live "around the clock" news reports, not to mention "zapping" during the commercial break. What does that leave us with? Essentially, with an image without end... And isn't it funny how it was Hitchcock, in the early days of television, who urged us to zap away from those deadly boring commercials?